With a modern stylish design, it combines Facial, Fingerprint, PIN recognition and offering the added option of an integrated RFID module. Equipped with our latest facial identification algorithm, it captures the relative position, size and shape of user’s eyes, nose, cheekbones and jaw features. These feature templates are used to match feature data when users register on the terminal, converting the captured features into value and comparing these to eliminate variance. Integrated with our newest and most advanced fingerprint algorithm version, ZKFinger10.0, it ensures high precision fingerprint identification. The BioFace series integrated 630MHz high speed ZK Multi-Bio processor and high definition infrared camera allows user identification in dark environments. Ideal for Time and Attendance Management, this series can operate on standalone mode, and also offers simple access control features, providing a complete easy-to-use system for small to medium installations. 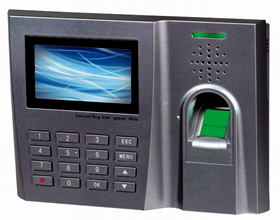 U160-C / U260-C is a biometric fingerprint Time & Attendance terminal with 3’’ TFT display. Easy to install, and with a modern design, it is the perfect solution for small installations. It incorporates the ZK fingerprint Sensor. The color TFT display offer users easy menu management. 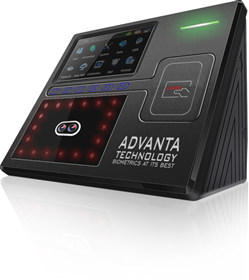 It can connect to Time & Attendance management software by Ethernet or USB port, and also operate on standalone mode, downloading data by USB pen drive. Optionally, it can incorporate a proximity reader. 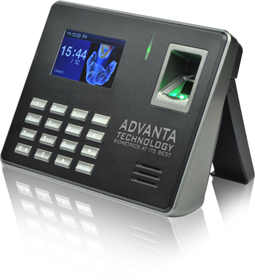 At Advanta Security we have researched the best biometric clock-in systems and security devices on the market. We wanted the most cost effective products, however did not want to compromise on quality. Most devices as standard have a basic Chinese software user interface, however with ours we written our own advanced software for the devices to enhance the user interface and created better features to maximise the potential of each product on our site. Our face recognition devices can even detect faces without light, and our fingerprint recognition devices can even distinguish between identical twins when you cannot. As you can see we have great state of the art biometric systems, that work with our own UK software helping you save money by upgrading to the best biometric security. 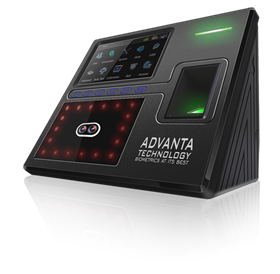 AdvantaSecurity.com Is a trading name of Advanta Group Ltd. We know you will also find our products as powerful as we do. Weather you need to know when a user arrives late, has too long for lunch, leaves work early or you want to open a door using just your face we have the products for you. Copyright © 2019 Advanta Security. All rights reserved.